SPRINGFIELD, OH (Jan. 15, 2019) — The Springfield City Service Department is prepared for response to water main breaks as frigid temperatures arrive. The City experiences water main breaks this time of year due to the weather and other factors. City Engineer Leo Shanayda explained that sustained cold temperatures will cause more breaks on water lines. Most city water mains are four feet below ground. As the frost line deepens, more downward force is applied to the water main, increasing the likelihood of a break in the metal pipe. Depth, age and material of the pipe, as well as condition of the pavement, are also factors, said Shanayda. “Oftentimes, residents don’t have an interruption of service because the repairs are made without depressurizing the water system,” said Utilities Program Coordinator Leslie McDermott. In some cases, water may be discolored after the repair. It is not harmful but could discolor fabrics during washing. Residents can run their water for an extended period of time to help clear their service line. The city responds to an average of 37 water main breaks a year, and most occur during the months of January and February. It is important that water main breaks are repaired in a timely manner to avoid unnecessary damage to the roadway and prevent leaking water from freezing on streets. 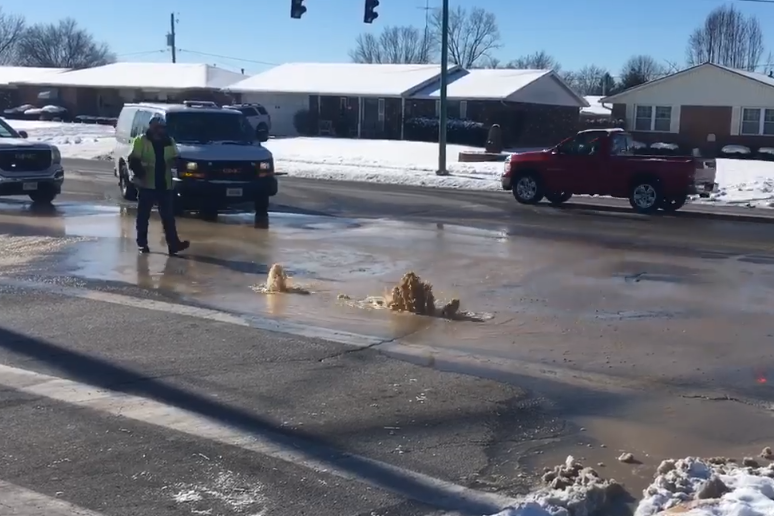 If you notice water pooling or flowing in the street, it may be a main break. Residents are encouraged to report these signs by calling the City Service Department at (937) 525-5800.